It’s a bird…it’s a plane…it’s Jamie Cullum. If you ever have the chance you must see Jamie Cullum live to experience his effervescent personality, him jumping on and off the piano, and some great music. Watch this video of “I Get a Kick Out of You” to get a taste. 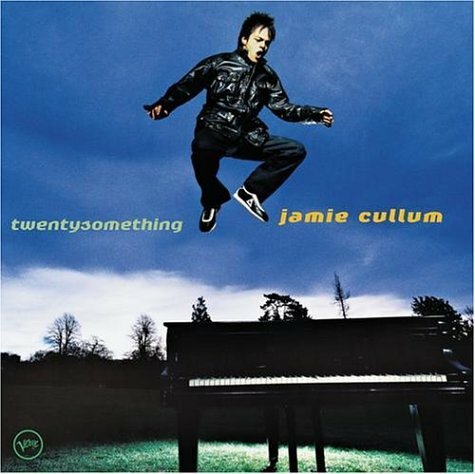 Born in England in 1979, Jamie has played piano and guitar since he was eight, and his older brother Ben, instilled an interest in jazz in him. He attended Reading University, during which he recorded his first album, “Heard It All Before,” at 19 years old. His third album, “twentysomething,” was his first major release on Verve, part of Universal Music Group. Jamie is influenced by many genres of music, as evidenced by his covers of Jimi Hendrix’s “Wind Cries Mary” and Rihanna’s “Don’t Stop the Music.” In addition, he has performed works by Kanye West, The White Stripes, Pharell, Pussycat Dolls, Radiohead, Gnarls Barkley, Elton John, Justin Timberlake, and Lady Gaga among others. Be sure to listen to our Jazz Appreciation Month playlist to hear some of Cullum’s music. “At first I didn’t think certain songs had a place in what I was doing with this jazz music but I’ve realised that everything does and it reaffirms my belief that jazz is the greatest platform to do whatever you want. People ask why I play jazz and it’s because you can take it to so many different places. You can embrace dance music, rock, pop music, classical, funk, everything,” says Jamie of his style to BBC Radio 2. Jamie also hosts a weekly radio show on BBC Radio 2 on Tuesday nights, where he features live sessions and guests from around the world. In 2009, Clint Eastwood and Jamie Cullum were nominated for a Golden Globe for their composition, “Gran Torino,” in the category of Best Original Song for a Motion Picture. Jamie, Berklee City Music likes your style and thanks you for your contributions to jazz.